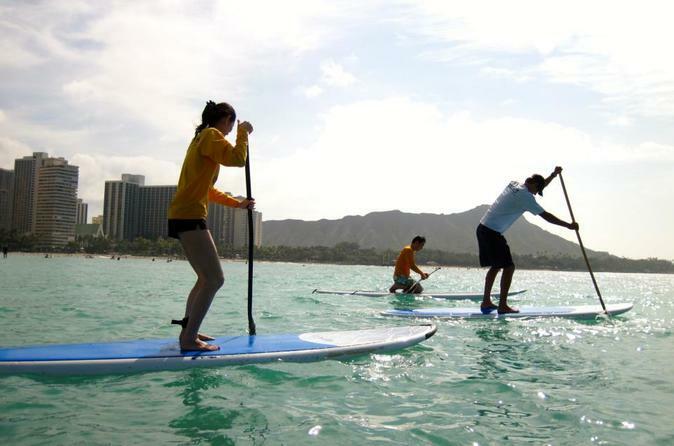 Learn how to stand up paddle with your own Waikiki Beachboy in the birth place of surfing. We are located in the heart of Waikiki, just steps away from the water's edge! A private lesson is the best way to maximize your time on the water. reasons. All participants must be able to swim. A private group lesson requires a minimum of 2 participants; a maximum of 5 participants per instructor to keep class sizes small. Choose your lesson time from 8:30AM, 10:00AM, 11:30AM, 1:30PM or 3:00PM. Lessons are available daily all year round. Located at the beautiful iconic Royal Hawaiian Hotel, AKA: Pink Palace. Our desk is located on the pool deck of the hotel property. You can find the desk by using the public beach access between Cheesecake Factory and Outrigger Waikiki Hotel on Kalakaua Ave.